One of the main achievements of the organization is thе competent and motivated team. The team relies on the initiativeness, creativity, innovatory and partnership. 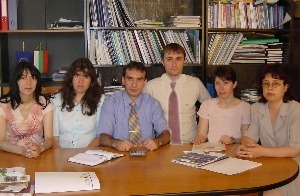 The organization has capacity and gained experience in: development and management of EU and international projects, business consultations of start-up, small and medium enterprises, support and work with young entrepreneurs, partnership establishment, operative programmes and NSRF consulting, knowledge transfer, professional training, information services and etc. Snezhana Dzhugdanova, Project coordinator: Education: master in economics and teacher in economics from SWU; 10-years’ experience in project development and management, preparation, organization, monitoring and realization of project activities, tender procedures, working with local initiative groups, human resources analyses and development expert, certified by infoDev in mentoring in business-incubation, training development and providing, Vocational Training Center of BI-GD activities, e-learning, ICT trainer under Global Libraries programmes, Microsoft Office certified trainer from Microsoft Academy Program, trainer in entrepreneurship, accountancy, economics, CAD-systems in textile design industry, key competences trainer. BI-GD attracts and collaborates with outside experts and partnering organizations and structures from Bulgaria and abroad.